Join us for Warren Homecoming 2018 this Friday, September 21 through Sunday, September 23! Numerous events will bring residents downtown and draw natives from far-flung corners of the nation back to the place they're proud to call home. For a full list of featured events, please see the Warren Homecoming Facebook Page. A temporary closing of East Market Street is scheduled to begin the evening of Friday, March 29 and last through Sunday, March 31. The closure is necessary for replacement of a rooftop chiller unit at Trumbull Memorial Hospital (Trumbull Regional Medical Center). The posted detour for traffic will be Laird Avenue, South Street, and Homewood Avenue. Due to the winter weather anticipated for this weekend, please be advised that the City of Warren will be under a PARKING BAN, beginning at 4:00 PM on Friday, January 18, 2019 and ending at 12 PM (Noon) on Monday, January 21, 2019. All vehicles must be cleared from all city streets to facilitate snow removal. High Street to Mahoning Avenue will be closed for the Greek Orthodox Independence Parade on Sunday, April 7. The closing will last from 12:00 noon to 1:00 PM. All phones are repaired and working properly. Thank you for your patience! The City of Warren plans to improve Reserve Avenue between Front Street and Southern Boulevard. The project proposes to rehabilitate the existing twin (6-span continuous steel beam) Reserve Avenue bridges constructed in 1975. To ensure the decision-making process is comprehensive, the City of Warren is seeking comments from the public about the social, environmental and economic impacts of this proposed project. Telephone and Internet services are running again at the Environmental Services Department following repairs by CenturyLink. Thank You ''Christmas in the Square'' Participants! The City of Warren would like to thank all the sponsors, volunteers, performers and participants at this year's Christmas in the Square event! Featuring a Christmas parade, photos with Santa, art gallery open houses, a cookie walk and so much more, the event brought hundreds of residents downtown the evening of December 1. FirstEnergy's Ohio utilities would like to remind customers having difficulty paying their utility bills that they may be eligible for special financial assistance programs. For detailed information on the assistance programs available to FirstEnergy customers, please see the full press release from FirstEnergy Corporation. City offices will be closed in observance of Columbus Day Monday, October 8. However, there will be no delay in garbage pickup; trash service will run on schedule for the week of October 8 through October 12. Please make sure your containers are at the curb. Any questions about garbage pickup can be directed to the Environmental Services Department at (330) 841-2561. For qualifications and more information, please see the flyer for this job opportunity. For a list of featured events, please see WarrenWire and Warren Homecoming Weekend on Facebook. On Friday, September 1, a local community group will Turn the Town Teal on Courthouse Square. Businesses, residents, and visitors will see Courthouse Square decorated with teal bows and ribbons representing National Ovarian Cancer Awareness Month. The decorations will last from September 1 to September 30. The Greater Warren-Youngstown Urban League maintains a Minority Business Assistance Center at 290 West Market Street. The center aims to provide minority entrepreneurs with management, technical, financial, and contract procurement services. Fourth Street S.W., from Highland Avenue S.W. to Valley Avenue S.W. The road closing will occur from 9:00 AM to 10:00 PM. Van Wye Street S.E., from Niles Road S.E. to Rogers Avenue S.E. The road closing will occur from 10:00 AM to 4:00 PM. Phones at the City of Warren Water Pollution Control Department are operating normally. Daytime reports should be made to (330) 841-2591. Trumbull Community Action Program is currently enrolling children aged 3 to 5 in its expanded Head Start program. The Head Start program's Warren location will feature four all-day classrooms, with the 2017-2018 school year beginning August 23. Registration can be completed at TCAP, 1230 Palmyra Road, or online at the TCAP Website. High Street will be closed at North Park Avenue and before the parking lot entrance for the Best Western and Hippodrome for the Art Hop on Saturday, July 22. The road closure will last from noon to 9:00 PM. WRTA will join with other public transportation systems nationwide to participate in the 12th Annual National ''Dump the Pump'' Day on Thursday, June 15. 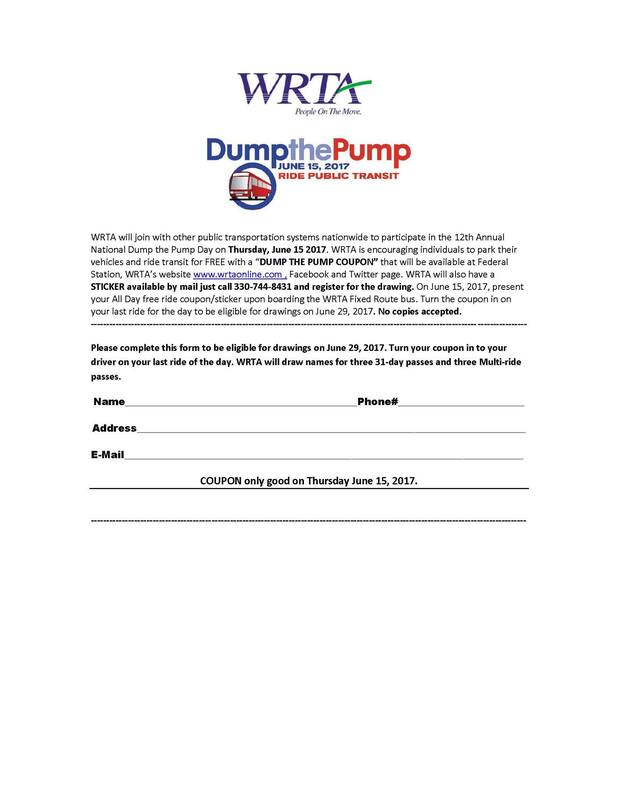 WRTA customers can ride for free that day with a "Dump the Pump" coupon flyer available online. For more information about "Dump the Pump" Day, visit the WRTA website. City offices will be closed in observance of Memorial Day on Monday, May 28. Garbage pickup will be delayed one day that week. For refuse collection questions, please call Environmental Services at (330) 841-2561. The City of Warren is the proud recipient of the 2017 Healthy Community Award! This is an outcome of our community's long-running effort to promote physical activity and improve nutrition. Signing up for service at the City of Warren Water Department is now via application process. Applications for service are at the City of Warren Water Department located at 580 Laird Avenue S.E.. For your convenience, an electronic version is available for download and printing below. Please refer to the Service Application checklist below for all information necessary to apply for service. The first week of May will be the first ever spring leaf collection week, offered to our residents by the Environmental Services Department. Please report power and street light outages to First Energy Corporation by calling 1-888-LIGHTSS (1-888-544-4877). When reporting street light outages, please be ready with the pole number and nearest street address of the pole. In order to better serve our customers, the City of Warren Water Department Office at 580 Laird Avenue S.E. will be performing computer software maintenance on Tuesday, March 14, 2017. Due to this maintenance, the office will need to close at 3:00 PM. The office will resume normal business hours from 8:00 AM to 4:00 PM on Wednesday, March 15, 2017. The Salvation Army is distributing winter coats at its 270 Franklin Street S.E. location. The distribution is taking place Monday through Friday from 9:30 AM to 11:30 AM and from 1:00 PM to 2:30 PM. Supplies are limited and distribution will be on a first-come, first-served basis. Recipients must bring a photo ID. For more information, call (330) 392-1573. City offices will be closed in observance of President's Day Monday, February 18. However, there will be no delay in garbage pickup. The City of Warren is sponsoring an Internet Buyer's Exchange Site for those who buy, sell, and trade items through Craigslist and similar online services. An Internet Buyer's Exchange Site allows these transactions to be made in a public space under surveillance, creating a more comfortable atmosphere for buyer and seller alike. City offices will be closed in observance of Martin Luther King, Jr. Day on Monday, January 21. There will be no garbage collection on Monday, January 21. Routes will run Tuesday through Saturday that week. For refuse collection questions, contact the Environmental Services Department at (330) 841-2561. First Energy will be trimming tree limbs and branches away from power lines through the end of November. The affected area covers North Leavitt Road to Southern Boulevard, between Parkman Road and West Market Street. Christmas in the Square will take place on Friday, December 7 from 5:00 PM to 9:00 PM in downtown Warren. The City of Warren, along with volunteers, area businesses, organizations and individuals have joined together to present this family friendly holiday event. Christmas in the Square will feature trolley stops around Courthouse Square, a cookie walk, photos with Santa, and live entertainment! Market Street, from Mahoning Avenue to Vine Avenue N.E. Vine Avenue N.E., from East Market Street to High Street N.E. The City of Warren Fire Department will hold its annual Open House Saturday, October 7 from 12:00 noon to 4:00 PM at the Central Fire Station, 111 South Street S.W. This event will feature various safety demonstrations, including a vehicle extrication (Jaws of Life), fire simulation, medevac helicopter rescue, Police K-9 unit, and smoke trailer. Refreshments will be served. The City of Warren would like to thank all the community organizers and participants who made Warren Homecoming a resounding success! Between Friday, September 23 and Monday, September 26, numerous events brought hundreds of residents downtown and drew natives from far-flung corners of the nation back to the place they're proud to call home. The City of Warren Water Department is publishing informational videos to help residents better understand Water Department operations and the treatment process that prepares our water supply for public consumption. Stay tuned for more videos produced or recommended by the Warren City Water Department! The Trumbull Community Action Program maintains a Food Co-Op that provides affordable, nutritious food to Trumbull County residents. Available items include meats, cheeses, milk, bread, eggs, pantry staples, and more. The Food Co-Op is open to the public Monday through Friday, 9:00 AM to 4:00 PM, on the first floor of TCAP's Warren West Building at 1230 Palmyra Road S.W. Warren Gridirion Club is proud to announce its upcoming NFL Legends Reunion and Celebrity Golf Outing, which celebrates Warren G. Harding and Warren Western Reserve football players who have gone on to play for colleges and professional teams. The event will take place September 25th and 26th. For more information, please contact Virginia Holmes at warrengrid@gmail.com. High Street N.E. : Closed between Elm Road and Vine Avenue N.E. Friday, April 29, from 8:00 PM through 10:00 PM. The same section of High Street will close Saturday, April 30 at 11:30 PM through Sunday, May 1 at 12:15 AM. Please be advised that tornado sirens will be tested city-wide today, April 28. For Packard Park shelter house and park pavilion rentals, please contact the Operations Department at (330) 841-2641. Office hours are 7:00 AM to 3:00 PM, Monday through Friday. The City of Warren Water Department has released an updated 2015 Drinking Water Consumer Confidence Report. This report explains the quality of drinking water provided to City of Warren utility customers. Included is a listing of results from water quality tests as well as an explanation of where our water comes from. Warren City Schools are conducting registration for Preschool and Kindergarten. Preschool registration is open to 3- and 4-year-old children, and Kindergarten registration is open to children who will be 5 years or older by September 30, 2016. To register your child, call (330) 675-4321. The Lime Tree's current ongoing exhibit will be on display. The Emergency phone lines at the Warren Fire Department are functioning normally following updates by Century Link. Please use the normal Emergency numbers if you need immediate assistance. The gates to Perkins Park will be closed 5:00 PM Friday, January 22 through noon Sunday, January 24 for the Boy Scouts Klondike Derby. The Klondike Derby is an annual district winter event where boys 11 to 17 build Scout skills in an outdoor environment, concentrating on character-building skills in winter conditions. Monday, December 31: No delay. The route scheduled for Mondays will run normally. Tuesday, January 1: No trash service. Routes normally serviced Tuesday through Friday will be picked up Wednesday through Saturday. Monday, December 24: No delay. The route scheduled for Mondays will run normally. Tuesday, December 25: No trash service. Routes normally serviced Tuesday through Friday will be picked up Wednesday through Saturday. City residents may dispose of their live Christmas trees at Bob's Tree Service, 1052 North River Road. Trees will be accepted between 8:00 AM and 4:00 PM, Monday through Friday, until February 1, 2019. All decorations, including tinsel, garland, popcorn, etc., must be removed prior to disposing. NO live trees will be picked up curbside. The Customer Service line for the City of Warren Water Department is currently down. CenturyLink is aware of the issue and working to restore it as soon as possible. Warren G. Harding High School will open its doors to the community for walking this winter. The building will be open from 5:30 PM to 7:30 PM for anyone looking for a warm, safe and lighted place to get some exercise. Please use the main entrance. Winter walking will be available from November 2 through April 4. Information courtesy of the November Warren G. Harding school newsletter. The City of Warren will hold this year's Trick or Treat on Wednesday, October 31 from 5:00 PM to 7:00 PM. The City's Health, Community Development, and Income Tax Departments are located at the Warren Government Center (Gibson Building) at 258 East Market Street. All three are located on the building's third floor. All telephone numbers for these departments remain unchanged. City offices will be closed in observance of Veterans Day on Monday, November 12. However, there will be no delay in garbage pickup. Please make sure your containers are at the curb as usual. For refuse collection questions, please call Environmental Services at (330) 841-2561. On August 26, Mayor Franklin joined with Howland Township Trustees, Trumbull County Commissioners, and the County Engineer to reveal the infrastructure improvement plan for the Golden Triangle Industrial Area. The plan proposes a series of public improvements to the county's busiest industrial area, including directional signage, reconfiguration of an intersection, and a new access road. It has been brought to the attention of CGI Communications, Inc., that a CGI phone number was being used in a robocalling scheme to dial members of the Warren, Ohio community. These calls resulted from the CGI phone system being hacked by an outside party, and have absolutely no affiliation to CGI or their working partnership with Mayor Franklin and the City of Warren. Mahoning Avenue N.W. will be closed at High Street N.W. and at West Market Street on Saturday, June 11, 2016 from 7:00 AM to 1:00 PM for the Warren Streetscape Clean-up. City offices will be closed in observance of Labor Day on Monday, September 3. Garbage pickup will be delayed one day that week. All routes will run Tuesday, September 4 through Saturday, September 8. For refuse collection questions, please call Environmental Services at (330) 841-2561. The filing deadline for Warren City taxes is April 15. For tax forms and instructions, please see the Income Tax Forms page. Mercy Health's "Stepping Out" program encourages citizens to stay in shape by attending free wellness classes and health screenings. Wellness classes offered through the program cover activities like Zumba, line dancing, strength training, and healthy cooking. For a full schedule of times and locations for February 2019, see the "Stepping Out" Program Flyer. The Warren Family Mission offers cold weather programs at its 1228 West Market Street and 155 Tod Avenue locations. The 1228 West Market Street location provides emergency shelter for men only, while the 155 Tod Avenue location provides warmth and hot drinks between 9:30 AM and 5:00 PM daily. For more information, call (330) 394-5437. The Geauga-Trumbull Solid Waste Management District sponsors a Christmas tree recycling program. Christmas trees can be dropped off at the Packard Music Hall parking lot seven days a week during daylight hours. Christmas tree collection will last from December 26, 2014 to January 23, 2015. Please remove all ornaments, hooks, tinsel and stands from trees before dropping them off. Warren Municipal Court will be closed Tuesday, December 25 and Wednesday, December 26 in observance of Christmas. All other City offices will be open Wednesday, December 26. The City of Warren is excited to release a series of online videos highlighting all our community has to offer its residents, visitors, and businesses. Click here or use the "Video Tour" button on the right-hand sidebar to view the videos. This project was developed in cooperation with CGI Communications, Inc., and supported by the local businesses community. If your garbage normally gets picked up on a Thursday, the Environmental Services Department will pick it up on Friday, November 23. If your garbage normally gets picked up on a Friday, the Environmental Services Department will pick it up on Saturday, November 24. Sealed Statements of Qualifications for the development and installation of a Public Wireless Network System will be received by the City of Warren Board of Control c/o Enzo Cantalamessa, Director of Public Safety & Service, until 4:30 PM on June 1, 2018. The City of Warren will hold this year's Trick or Treat on Saturday, October 31 from 4:00 PM to 6:00 PM. View a Trick or Treat tips flyer. The City of Warren Police Department participates in RAIDS Online, a system that empowers citizens with an easy-to-use map of recent crimes, an analysis dashboard, alerts signup, and the ability to submit anonymous tips for specific crimes online. Please use this link to access the system through your web browser. There are no bids or legal notices at this time. The Trumbull County Health Department recently filed a report detailing the results of the Annual Bike to Work Day Breakfast held in Warren. Bike to Work Day encourages Trumbull County residents to be physically active by bicycling to work. Below are pictures from the Bike to Work Day event and a link to the report. Read the Bike to Work Day Breakfast report. Join us for the 34th Annual Italian American Festival in Courthouse Square this Thursday, August 9, through Sunday, August 12! This festival celebrates Italian American culture and heritage with a weekend of great food, rides, entertainment, and more. Join us for the 34th Annual African American Achiever's Association Festival in Courthouse Square this Friday, June 1, through Sunday, June 3! This festival celebrates African American culture and heritage with a weekend of great food, rides, entertainment, and more. City offices will be closed in observance of Independence Day on Wednesday, July 4. Garbage collection for routes normally picked up Wednesday through Friday will run Thursday through Saturday. For refuse collection questions, please call Environmental Services at (330) 841-2561. This is a reminder that General Elections will be held Tuesday, November 6. Polls will be open from 6:30 AM through 7:30 PM. The Trumbull County Board of Elections website provides a wealth of information about election procedures; citizens who are unsure of their polling location may consult the Board's Poll Location Finder page. Please remember to bring I.D. when voting. On April 2, the City of Warren completed the last of 151 demolitions funded by the "Moving Ohio Forward" Grant. Managed by the Ohio Attorney General's Office, the "Moving Ohio Forward" program helps local governments demolish abandoned buildings with the aim of strengthening the housing industry. The Warren City Health District will offer walk-in clinics for child immunizations from 9:00 AM to 11:00 AM, and from 1:00 PM to 3:00 PM, on Monday, April 9. The Warren City Health District is located on the third floor of the Government Services Building, 258 East Market Street. The Trumbull Community Action Program (TCAP) is offering emergency utility bill assistance to eligible households through the Winter Crisis Program until March 31. Residents interested in learning more can set up a weekday afternoon appointment by calling 1-866-747-1041. Information courtesy of the Tribune's "Community" section, page 2B, 12/30/2016. The Save a Life Smoke Alarm (SALSA) Program has a new dedicated phone number: (330) 841-1363. SALSA offers the installation of free smoke alarms in Warren homes. The City's Firefighters Union established SALSA to prevent the tragic loss of lives in fires. The City of Warren participates in a natural gas aggregation program offered through the Northeast Ohio Public Energy Council, or NOPEC. This program is available for eligible Warren residents who have service with Dominion East Ohio, and who currently are not under contract with any other natural gas supplier. The Warren Police Department will conduct its six-week Citizen's Police Awareness Academy beginning March 27. Classes will be held every Monday evening from 6:00 PM to 9:00 PM. The program's objective is to help citizens reach a better understanding of local law enforcement in their community.